We’ve taken a quick look at several position groups for the 2019 NFL Draft, mainly those skill players (RB, WR) who make an impact in the public’s eye. How about those guys in the trenches who protect and pave the way for their respective skill position players? They need some love too. With that in mind, here are the top three offensive linemen, eligible for the 2019 NFL Draft at each position, in terms of their pass-blocking efficiency from a season ago. 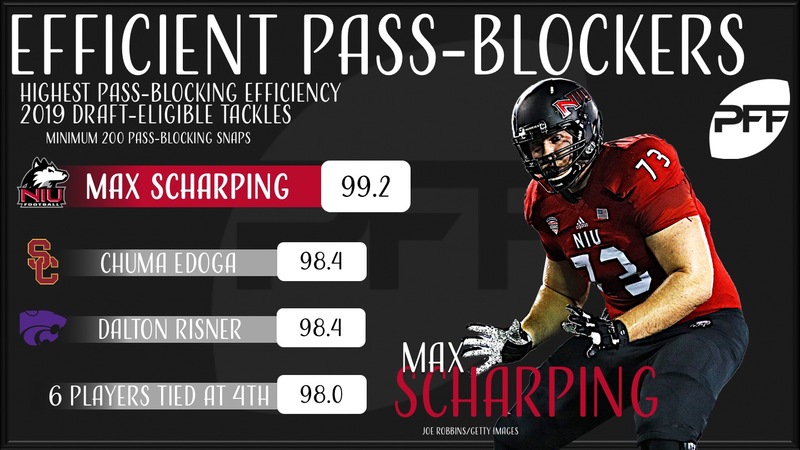 The face of pass protection among 2019 draft class tackles, Scharping ranked third in pass-blocking efficiency in 2015 (97.1), first in PBE in 2016 (98.9) and capped that by finishing first again in 2017 among his classmates. He allowed just four pressures a season ago, across 459 snaps in pass protection. The senior has allowed just 21 total QB pressures during his career at NIU on a whopping 1,377 pass-blocking snaps. Scharping has not allowed a sack since the Huskies bowl game against Boise State in 2015. Edoga allowed just six total pressures on 328 snaps in pass protection in 2017, albeit three of those pressures were sacks. Despite allowing the three sacks, 2017 goes down as by far Edoga’s highest-graded season of his career to date, meaning he’s trending in the right direction. If he can tighten up a bit more and limit the sacks, he may grade even higher and vault up draft boards. Another player like Scharping, Risner has planted his name along the all-time greats at pass protection in the PFF College era, and he’s got another season to prove his worth. He has allowed just 23 total QB pressures on a total of 1,116 pass-blocking snaps and like Scharping, has not allowed a sack in a long time. In fact, it’s been since Week 5 against West Virginia in 2016 that Risner last gave up a sack. To his credit, that is the only sack Risner has allowed in his three-year college career to date. While Briggs did not allow a sack or a QB hit, he remains tied atop the leaderboard here with WMU’s Juriga after allowing four hurries on 290 pass-blocking snaps. A transfer from Coffeyville Community College last season, Briggs showed well in his first season of major college football. 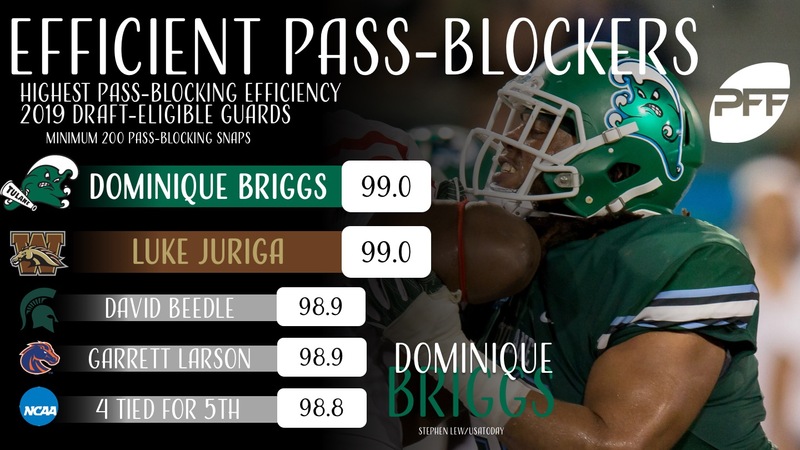 Juriga spent 323 snaps in pass protection a season ago and allowed just four pressures. He did allow a sack but also kept a clean sheet in pass protection in eight contests a season ago, improving vastly from 2016 in which he allowed 10 total pressures and at least one pressure in eight contests. Beedle stands as the only member of a Power-5 conference team to crack the top four among guards as he allowed just four pressures on 280 pass-blocking snaps in East Lansing last year. Like Briggs, he did not allow a sack all season in 2017, a year much improved from 2016 in which he allowed 25 total QB pressures and nine combined sacks and hits. Larson allowed just three total pressures last season, leading the trio of players tied atop the fewest pressures allowed list in terms of snaps in pass protection played with 235. All told, that places him tied for third in pass-blocking efficiency as pass-blocking is clearly his strong suit for the Broncos. O’Hagan has found himself near the top of the list of pass-blocking centers ever since a shaky start to his career in 2015. O’Hagan allowed a whopping 20 pressures as a freshman but has since allowed just four pressures in his last two seasons combined. Last season, he allowed just two hurries and in fact, has not allowed a QB hit since Week 11 of the 2016 season and has not allowed a sack since Week 10 of the 2015 season. He finished first in pass-blocking efficiency in 2017 and in 2016 among draft-eligible centers. Keenoy is the second member of the Western Michigan offensive line to find themselves on one of these shortlists as he allowed just two pressures on 329 snaps in pass protection in 2017. Like O’Hagan, Keenoy vastly improved after a rough outing in his first season, having allowed 25 total QB pressures in 2015 compared to just seven total pressures over the past two seasons combined. Despite allowing four sacks during his freshman season, he hasn’t allowed a sack since Week 11 of the 2015 season. Reynolds joins the list of eight draft-eligible centers who didn’t allow a sack or a QB hit last season, having done so on 290 pass-blocking snaps. Reynolds has spent a total of 517 snaps in pass protection during his first two seasons at UL-Monroe and has not allowed a single QB hit or sack.